Email marketing is a method of advertising direct to targeted customers who have opted in to receive promotional emails from your business. Email marketing is increasing in popularity as it is capable of tracking results and costs to provide a demonstrable return on investment. This email marketing ROI calculator will help you to measure marketing roi for any email marketing campaign. 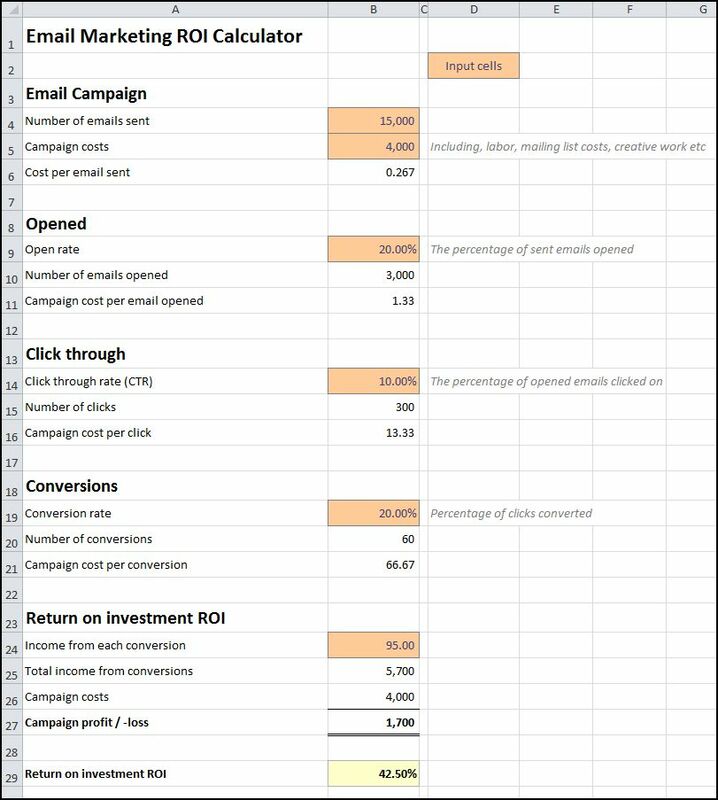 The Excel email marketing ROI calculator, available for download below, shows how to calculate email marketing roi by entering details relating to the email marketing campaign as follows. The number of emails sent and the total campaign costs are entered. The email marketing ROI calculator calculates the cost for each item of email sent. The estimated open rate is entered. This is the percentage of emails sent which get opened. The email marketing ROI calculator calculates the expected number of opened emails, and the email marketing campaign cost for each email opened. The estimated click through rate (CTR) is entered. This is the percentage of emails opened which get clicked on. The email marketing ROI calculator calculates the expected number of clicked emails, and the email marketing campaign cost for each click through. The conversion rate is entered. The conversion rate is the percentage of emails clicked on which are expected to convert and take the action required. The action required is typically, for example, to make a purchase from the business. The email marketing ROI calculator calculates the expected number of conversions and the email marketing campaign cost per conversion. The expected income from each conversion is entered. This is the income the business anticipates from the required action being carried out. For example, if the required action is to make a purchase from the business, the income from each conversion is the gross profit from that purchase. The email marketing ROI calculator calculates the campaign profit or loss by deducting the campaign costs from the total income from all conversions, and uses this to work out the return on investment ROI for the campaign. 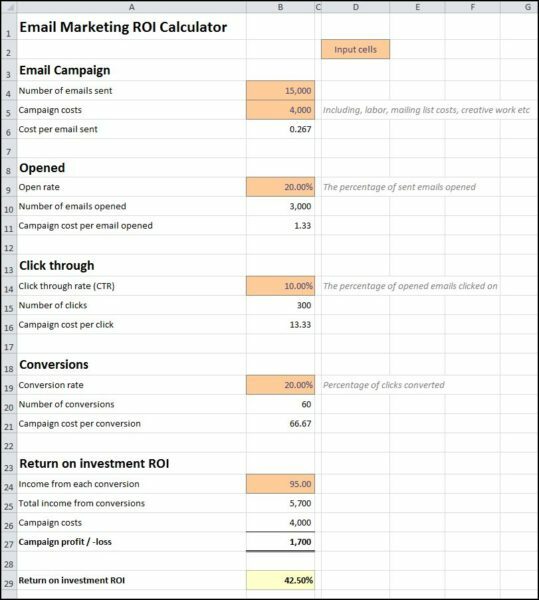 The email marketing ROI spreadsheet is available for download in Excel format by following the link below. Users use this email marketing roi software at their own risk. We make no warranty or representation as to its accuracy and we are covered by the terms of our legal disclaimer, which you are deemed to have read. This is an example of an email marketing tool that you might use. It is purely illustrative. This is not intended to reflect general standards or targets for any particular company or sector. If you do spot a mistake in the return on marketing investment calculator, please let us know and we will try to fix it.